The new Nikon D750 full-frame camera is expected to be announced next week, around September 11, 2014. The D750 is the much anticipated follow-up to the wildly popular D700 DSLR. It will offer action, wildlife and sports photographers a professional-level full-frame alternative to the flagship D4s. Specifications are yet to be officially released, but the Nikon D750 will offer a 24.3 megapixel FX-format sensor capable of 6.5 fps continuous shooting without an external battery or accessory grip. It will also use the advanced MultiCAM 3500FX 51-point AF system as found in the D4s and D810 with group area AF, 3D tracking and face recognition. As a professional camera it will incorporate full weather sealing and a magnesium alloy chassis and body. Whether it will be capable of 4K video is another question, but it should support at least full HD 1080×1960 resolution at 60p. The D750 will retain the traditional SLR construction with a reflex mirror rather than a mirrorless configuration with an electronic viewfinder. Internally the D750 will use the latest EXPEED 4 processor and capable of ultra-high ISO, although it is not expected to compete with the D4s in terms of the highest ISO levels. The D750 will be released within weeks after its announcement, which puts its street date around the first week of October. Expect it to be wildly popular and quite possibly backordered for months because of high demand. 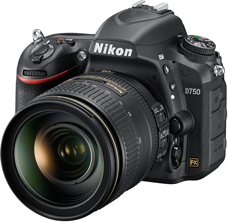 To assure first availability, pre-order the Nikon D750 promptly. Rumors of the new Nikon D750 have surfaced, the new action DSLR will feature a 24 megapixel full-frame sensor, 51-focus points (most likely borrowed from the D4s), continuous shooting up to 6.5fps (without requiring a battery grip), and a 91,000 pixel RGB sensor with advanced scene recognition. The camera will likely be announced in September during Photokina, September 16-21, 2014 and should be available about 2 to 4 weeks later.